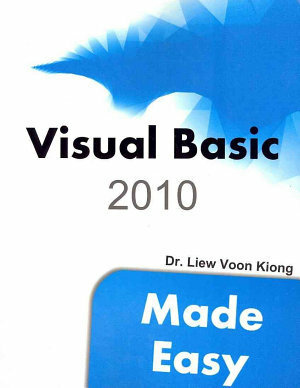 Although Visual Basic 2010 is a programming language designed for creating business applications, it can be used to create animation. In this lesson, we shall illustrate to create animation with VB2010 through a few examples. 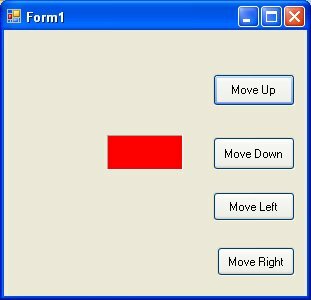 In VB2010, you can use the Top and Left properties of an object to create animation. The Top property defines the distance of the object from the topmost border of the screen while the Left property defines the distance of the object from the leftmost border of the screen. By adding or subtracting the distance of the object we can create the animated effect of moving an object.Start a new project and name it as Movable Object, or any name you wish. Now insert a PictureBox and in its Image property import a picture from your hard drive or other sources. Next, insert four command buttons, change their captions to Move Up, Move Down, Move Left and Move Right. Name them as MoveUpBtn, MoveDowbBtn, MoveLeftBtn and MoveRightBtn. We can create auto animation using timer without the need to manually clicking a command button. we shall show you how to write the code. First, insert a PictureBox into the form. In the PictureBox properties window, select the image property and click to import an image file from your external sources such as your hard drive, your Pendrive or DVD. 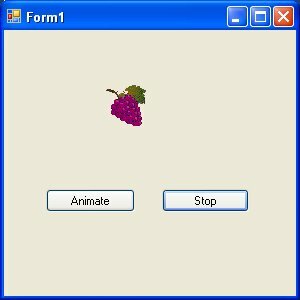 We have inserted an image of a bunch of grapes.Next, insert a Timer control into the form set its interval property to 100, which is equivalent to 0.1 seconds. Finally, add two command buttons to the form, name one of them as AnimateBtn and the other one as StopBtn, and change to caption to Animate and Stop respectively.